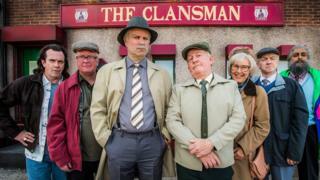 The BBC has called last orders for its popular Scottish comedy show Still Game. The BBC One hit will return for a ninth and final series later this year before characters Jack and Victor go into comedy retirement. Filming will start on the new series at BBC Scotland's Dumbarton Studios and around Glasgow in August. Comedy partners Ford Kiernan and Greg Hemphill said the time was right to retire Still Game from TV. They promised a "must-see" finale for fans across the country. Greg Hemphill, who plays Victor McDade, said: "Still Game is a story 21 years in the making. "We've had an amazing run but one of our hopes when we brought the show back was that we would get the opportunity to finish Jack, Victor and the gang's journey. Ford Kiernan, who plays Jack Jarvis, added: "I can't believe 21 years have passed in what, for us, has been an outstanding experience of collaboration, storytelling and performing. "But above all being fortunate to entertain people and make them smile. So when the last episode airs we hope your memories of our little gang will be fond ones." In the final series of Still Game, Jack and Victor will reunite with all of Craiglang's comedy pals including Jane McCarry (Isa), Sanjeev Kohli (Navid), Gavin Mitchell (Boabby), Paul Riley (Winston) and Mark Cox (Tam) for six new episodes. Further casting will be announced in the coming weeks. Shane Allen, controller of comedy commissioning, celebrated Still Game's comedy achievements: "Ford and Greg have achieved that rare beauty of making a modern classic sitcom that has made millions laugh and will be enjoyed for decades to come. "This new series is another riot of rich character based comedy and sees all our old pals from Craiglang off in style." Steve Carson, BBC Scotland's head of multiplatform commissioning added: "Still Game is a once-in-a-generation comedy that attracts audiences of all ages. "Jack, Victor and the gang at the Clansman have made millions laugh by growing old disgracefully and we're going to miss them when this fantastic new series concludes." Since making its TV debut in 2002, Still Game has become a comedy phenomenon.